Such sentiments make the Swallow Necklace, an ideal gift for the one you love most. Historically, the swallow carried great symbolic value for sailors to show their sailing experience and adventures. A sailor would have one swallow tattooed before setting out on a journey, and the second upon his return to the home port. It was believed that should a sailor not make it home, the swallows would carry their soul to the heavens. This led many sailors to start adopting the Swallow as a symbol of hope and a successful finish to a long journey. Seeing swallows was a sign that their travels were nearing an end as these birds never traveled far out to sea. The sighting of the swallow meant that land was near and that the long voyage and adventures were coming to an end. For many, many years the Swallow has also been considered a welcome bird, and the symbol of the spring awakening and revival of life and love. Such representation is carried in various cultures. In classical Chinese paintings, the swallow represents happiness and the arrival of Spring. Additional portrayals show the bird as, daring, risk-seeking and a symbol of change for good in the future. In old Egyptian poetry, the swallow is described as bringing the first sign of new love. Echoing the belief of the swallow symbolising love, care and affection towards their loved ones. 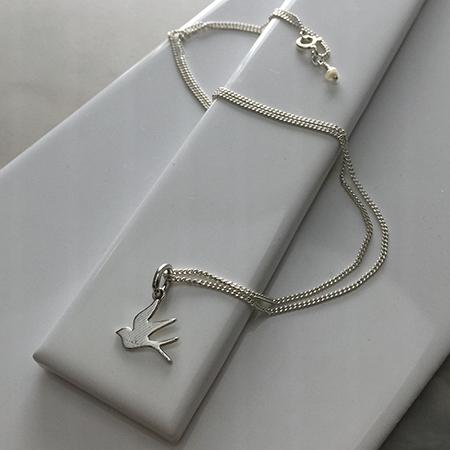 Swallow Necklace makes for the most meaningful and thoughtful gift to show your special someone just how much they mean to you. Remind them of just how you love and care for them with this beautiful piece of jewellery. The Swallow Collection includes a Swallow Necklace, Swallow Stud Earrings and a Swallow Charm. Perfect little gift for friend, daughter or christening. Swallow Necklace by Bianca Jones Jewellery, a symbol of loyalty & hope.